We've just added some improvements to 123Landlord to allow you to search for properties more easily, as well as organize and prioritize better. 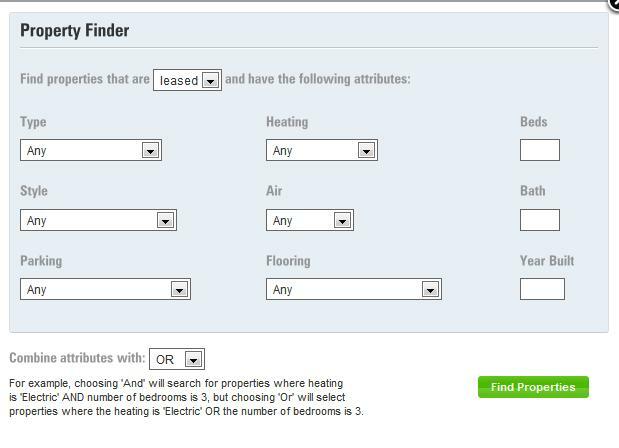 A new button has been added to the Properties list - "Find records by multiple search criteria"
Here you can perform a search based a range of property attribute criteria. For example, you can find all vacant properties that have 2 bedrooms, and a property type of 'Apartment LoRise'. You can mix and match different search criteria, depending on what you select, the system will find results where ALL criteria are met ("AND") or where any of the specified criteria are met ("OR"). The "And" setting is the most restrictive but will really let you pinpoint your search, and the "Or" setting is less restrictive and will let you find more properties if you don't need to be completely specific in your search. This will display a color palette selector box, where you can select a color to highlight the record row. When you select one, the screen refreshes and the row is colored accordingly. You can use whatever coloring system that makes sense for your purposes. For example, you might want to highlight tenants that have high outstanding balances with a certain color, or perhaps you need a way to quickly identify tenants that you need to schedule a meeting or walk-through with - again, whatever makes sense for you, you can adopt a system of highlighting these rows to suit your needs.